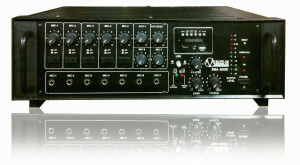 SSB-120DP is a PA mixer amplifier of rated output 120 Watts. It has an built-in MP3 Digital Player with highly useful features like LCD display, remote control, and facilities for REPEAT, PAUSE, VOLUME UP / DOWN etc. It can read USB drives, SD & MMC cards, making it a versatile multi-application music centre. The Digital Player accepts USB drives & SD/MMC cards, reproducing clear, high quality music. A remote control is provided for controlling the functions of the Digital Player from a distance. This, combined with 5 Microphones inputs, 2 Aux inputs, and provision for multiple speaker connections makes this product ideally suited for a variety of music programmes and public address applications. 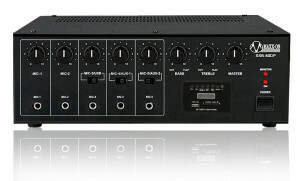 SSB-100 DP is a PA mixer amplifier of rated output 100 Watts. This, combined with 5 Microphones inputs, 2 Aux inputs, and provision for multiple speaker connections makes this product ideally suited for a variety of music programmes and public address applications. 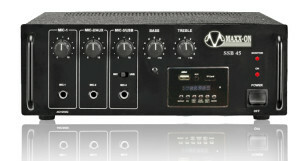 In addition ±10dB Cut/Boost Bass/Treble controls and AC/24V battery operation are provided. SSB-45DP is a PA mixer amplifier of rated output 45 Watts. It has an built-in MP3 Digital Player, making it a versatile multi-application music center. The Digital Player plays back clear, high quality Mp3 music from an USB drive. A remote control is provided for easily operating the Digital Player from a distance. This, combined with 3 microphone inputs, 1 Aux input and provision for multiple speaker connection makes this product ideally suitable for a variety of music programmes and public address application. SSA-350 DP is a multi application high Power PA Amplifier capable of delivering 350 Watts, ideal for driving high power sub-woofers as well as large PA Installations involving large number of speakers. This amplifier is designed to give high power, clean sound and reliable, trouble free operation under extreme climatic & weather conditions. Features include 7 microphone and 2 aux. In addition resettable circuit protector, ±10dB Cut/Boost Bass/Treble controls and AC/36V battery operation are provided. SSA-5000 DP is a multi application high Power PA Amplifier capable of delivering 500 Watts, ideal for driving high power sub-woofers as well as large PA Installations involving large number of speakers. This amplifier is designed to give high power, clean sound and reliable, trouble free operation under extreme climatic & weather conditions. Features include 7 microphone and 2 aux. In addition resettable circuit protector, ±10dB Cut/Boost Bass/Treble controls and AC/36V battery operation are provided. 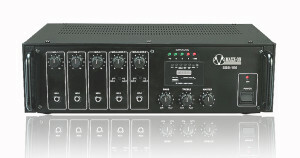 SSA-250DP is a PA mixer amplifier of rated output 250 watts, fitted with a MP3 Digital Player. The Digital Player features outstanding wide spectrum sound quality, combined with highly useful features like LCD display, remote control, and facilities for REPEAT, PAUSE, VOLUME UP / DOWN etc. It can read USB drives, SD & MMC cards. 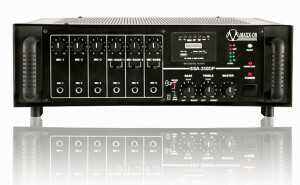 SSA-250DP has all the other features like 6 Mic inputs, 2 Aux inputs, cut / boost type bass & treble controls, resettable circuit protector, and provision for connecting 24V battery. Facility is given for mixing MP3 playback signal with both Aux and most Mic inputs. This is a rugged and highly reliable product, ideally suited for a wide variety of music and public address applications. SSA-160DP is a PA mixer amplifier of rated output 160 Watts. It has an built-in MP3 Digital Player with highly useful features like LCD display, remote control, and facilities for REPEAT, PAUSE, VOLUME UP / DOWN etc. It can read USB drives, SD & MMC cards, making it a versatile multi-application music centre. The Digital Player accepts USB drives & SD/MMC cards, reproducing clear, high quality music. A remote control is provided for controlling the functions of the Digital Player from a distance. This, combined with 5 Microphones inputs, 2 Aux inputs, and provision for multiple speaker connections makes this product ideally suited for a variety of music programmes and public address applications. 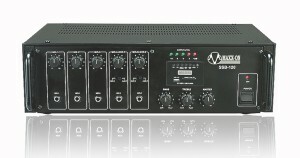 SSB-80DP is a PA mixer amplifier of rated output 80 Watts. It has an built-in MP3 Digital Player, making it a versatile multi-application music center. The Digital Player accepts USB drives, and reproduces clear, high quality music. A remote control is provided for controlling the functions of the Digital Player from a distance. This, combined with 5 microphone inputs, 2 Aux input, and provision for multiple speaker connections makes this ideally suitable for a variety of music programmes and public address applications. 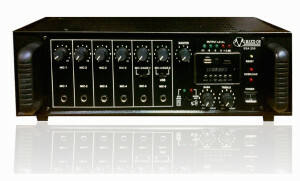 SSB-60DP is a PA mixer amplifier of rated output 60 Watts. It has an built-in MP3 Digital Player, making it a versatile multi-application music center. The Digital Player accepts USB drives, and reproduces clear, high quality music. A remote control is provided for controlling the functions of the Digital Player from a distance. This, combined with 4 microphone inputs, 1 Aux input, and provision for multiple speaker connections makes this ideally suitable for a variety of music programmes and public address applications.